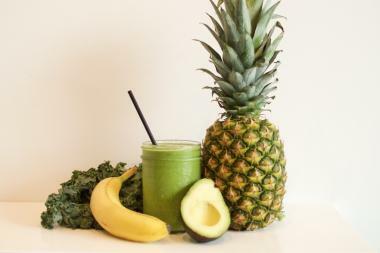 True North has sold more than 2,000 smoothies and more than 49-percent of those were kale banana smoothies. ANDERSONVILLE — In six months of business, Andy Peters has learned at least one thing about Andersonville residents — they really like kale. Since True North opened at 5507 N. Clark St. in Feb., the health-conscious cafe has sold more than 2,000 smoothies, and more than 49-percent of those were kale banana smoothies. In contrast, the next biggest seller was the Outrageous, a combination of strawberries with rolled oats and almond milk, which made up about 13-percent of smoothie sales, according to Peters, the owner of the cafe. "We often wonder why the Kale Banana is so popular and I think it is the perfect combination of interesting, healthy, and delicious," he said. "Word of mouth has also helped... A lot of people come in and say someone recommended it. Plus, we have people who come almost every day and get one." "Or maybe it's just because it's the first one listed on the menu. Who knows?" said Peters. To celebrate the cafe's 6-month anniversary, its number one seller will be only a buck on Saturday, he said. And if you're not a fan of kale and bananas, all other smoothies will be $3. Cold brew coffee, hot coffee and teas will be $1.